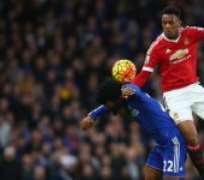 Manchester United manager Jose Mourinho is prepared to allow Anthony Martial to leave Old Trafford for Stamford Bridge in a bid to land main target Willian. According to the Mirror , United are working hard on a last-ditch swap offer to bring Willian to Manchester and boss Mourinho is willing to give up French star Martial in return. Former Blues boss Mourinho has made the Brazilian his number one target since the window opened and is desperate on beating Spanish giants Barcelona to securing Willian's services. Willian has already irritated new Blues boss Maurizio Sarri by arriving back late from his summer break, claiming that a passport problem was the reason for his late arrival. Both Willian and Martial are open to the idea of leaving their current sides and are both valued at £75 million by their respective clubs. And with Mourinho growing concerned over the lack of big name signings during the current window, Chelsea may well end up accepting United's swap offer involving Martial before the window slams shut on Thursday.